The hare, I am lead to believe, is a sign of good fortune! Whether or not you believe this, the boxing hare design always reminds me, at least, of countryside and open fields. What better way to start your day than with a cup of tea and a slice of countryside living!! 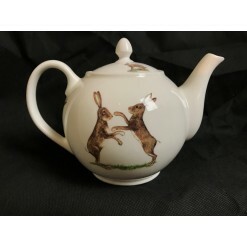 This 100% English Bone China teapot is perfect for brewing your morning cup of tea over breakfast!..